For IT News Week 4 Mar 2017. 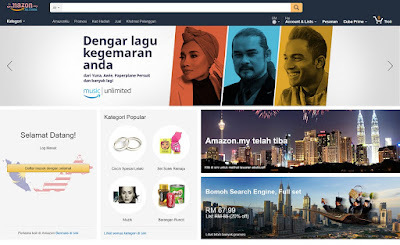 Amazon with exclusive affiliate partner iPrice Malaysia premieres the first screenshots of the all new and exciting online shopping platform : Amazon.my. Slated to be launched late 2017, millions of local and international products will be made available to Malaysia with same-day delivery service countrywide. Maintaining the ethos of Amazon, the new e-commerce platform in Malaysia will be guided by four principles : customer obsession rather than competitor focus, passion for invention, commitment to operational excellence, and long-term thinking. Partnering Amazon in this new endeavor is iPrice, a meta-search website in seven major countries in SEA as Amazon's prime affiliate partner. With similar values and vision for e-commerce in SEA, iPrice's partnership with Amazon will empower the Seattle based company with the needed marketing channels to aggressively market its products and services to the competitive e-commerce sector. AIG Malaysia Insurance Berhad, a subsidiary of American International Group, Inc., won the Best Insurer 2016 award at the MRC Symposium 2017, here yesterday. 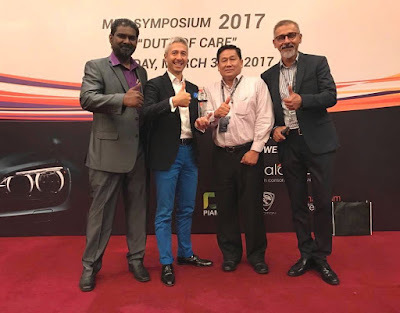 (L-R : ) Antony Lee, CEO of AIG Malaysia (second from left) together with the Auto Insurance Claims Team (left to right) Paul Sylvester Panjanathan, Head - Personal Lines Claim; Yew Sin Nam, Manager - Claims Technical Control and Dilsher Singh, Vice President - Claims & Operations. “We are truly honored to receive this award and to be recognized as a leader in the industry for our commitment to providing our customers exceptional motor claims service,” said Antony Lee,Chief Executive Officer of AIG Malaysia. Telstra is now officially accepting nominations for the annual Telstra Business Woman in Asia Award, with a new criteria added this year to include female entrepreneurs, not-for-profit and social enterprises in Asia. The Telstra Business Women’s Awards have been operating in Australia for more than 20 years, with the Asia category added in 2016 to celebrate women living and working in Asia who have succeeded in their own businesses or led their industries. This year marks the second time Telstra Business Woman in Asia Award is being held. The inaugural Telstra Business Women’s Awards in Asia witnessed outstanding women business leaders from Cambodia, Hong Kong, India, Indonesia, Malaysia, Philippines, and Thailand. 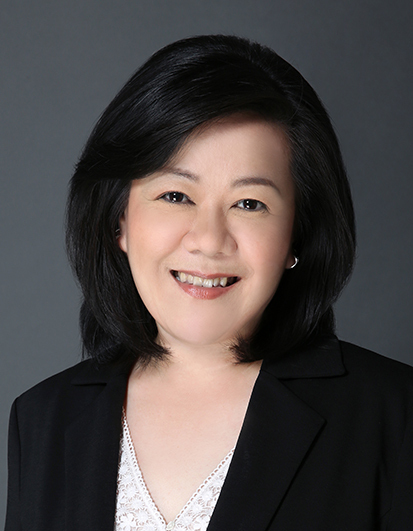 Last year, Anu Sheela, co-founder of iGene Sdn Bhd represented Malaysia as a finalist in the Telstra Business Woman in Asia Award 2016, being recognized as one among the successful business women across Asia. Entries for the 2017 Telstra Business Women’s Awards open Wednesday 26 April 2017 and close on Thursday 15 June 2017. At its recently held 9th Annual General Meeting, Malaysia Internet Exchange (“MyIX”) operated by the ‘Persatuan Pengendali Internet Malaysia’ – an initiative under the Malaysian Communication and Multimedia Commission ('MCMC'), unanimously agreed to invite more foreign players to join the country’s exchange. The move is in direct effort to tap more International Content Brands (“ICBs”) and regional internet service providers to peer directly with MyIX. This will bring about significant benefits for local members as well as ordinary Malaysians. At present, several foreign companies have already peered with MyIX. They are S.I. Group Ltd (Cambodia), TATA Communications (Hong Kong) and ViewQuest Pte Ltd (Singapore). With the local market saturated, the Exchange aims to increase its foreign membership in 2017. As at March 14 2017, total membership comprises 39 ordinary members, 33 associate members and 16 peering partners for a total membership of 88. According to MyIX Chairman, Chiew Kok Hin, the move to admit foreign members will accelerate MyIX’s development into a world-class Internet eco-system and Internet peering hub. Brocade today announced the Brocade® G610, a no-compromise storage switch for always-on connectivity to the all-flash data center. This breakthrough switch leverages the power of Brocade Gen 6 Fibre Channel technology, providing up to 32 Gbps performance, unmatched simplicity and enterprise-class functionality that helps organizations adapt to dynamic workloads and new demands for always-on business operations. Brocade also announced expanded monitoring capabilities through Brocade Fabric Vision™ technology with the availability of VM Insight. 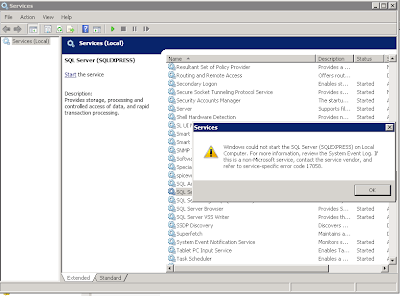 VM Insight delivers proactive visibility into the health and performance of individual virtual machines (VMs) to help administrators uncover issues before applications are affected. The costs associated with cyber attacks on the financial sector are rising as organizations face increasingly sophisticated threats. New research by Kaspersky Lab and B2B International reveals the scale and impact of attacks, with financial firms facing losses of nearly a million dollars ($926,000) on average for each cyber security incident they face. The staggering figure is revealed as part of Financial Institutions Security Risks 2016, a survey of finance professionals highlighting the main security challenges for banks and financial institutions around the world and the financial costs of specific cyber attacks. The most-costly type of incident for financial organizations are threats that exploit vulnerabilities in point-of-sale (POS) systems, in which an organization typically loses $2,086,000. Attacks on mobile devices are the second most costly ($1,641,000), followed by targeted attacks ($1,305,000). Astro today announced that all its customers will have free access to Astro GO (previously known as Astro on the GO) app as part of their existing subscription. The enhanced Astro GO was relaunched on a new user interface which is sleeker and intuitive to use with more relevant and personalized content surfaced for each individual viewer. As an added sweetener, from 1 April to 31 May 2017, all Astro customers who have registered and linked their Astro GO account can enjoy free viewing* of all TV channels and on demand content on Astro GO regardless of their package take up and entitlement. Non-Astro customers who download the new Astro GO app will also have access to selected Astro channels during this period. As a special treat, all registered and linked Astro GO users can watch “La La Land”; a drama film featuring Ryan Gosling and Emma Stone for free via on demand from 25 April to 31 May 2017. Astro GO app has recorded 3.2 million downloads and 1.1 million registered users. More significantly, viewing time on Astro GO has increased three-fold from less than 60 minutes in its initial launch to 215 minutes per week per user today. Silver Peak, the global leader in broadband and hybrid WAN solutions, today announced a series of new advancements to the Unity EdgeConnect high-performance SD-WAN solution that will enable enterprises to realize the advantages of a thin branch office. These advancements simplify and consolidate branch office infrastructure, shift the WAN edge toward being application-driven and enable secure, direct internet connectivity to SaaS and trusted web-based applications from the branch office. “By 2020, more than 50 percent of WAN edge infrastructure refresh initiatives will be based on SD-WAN versus traditional routers.” adds Png. Silver Peak EdgeConnect liberates enterprises of all sizes, from the cost, complexity and headaches associated with legacy router-centric branch office infrastructure. Whether they are hosted in the cloud or the data centre, enterprises can now confidently embrace commodity broadband. The consolidation of branch office infrastructure will dramatically simplify operations and lower costs without sacrificing network or application performance. “Our deployment of the EdgeConnect SD-WAN solution brings us new levels of simplicity and flexibility in connecting our employees to business applications using cost-effective broadband transport,” said Ray Stegmaier, senior director of network operations, Radial Inc. Carbon Black today unveils the results of its latest research report, “Beyond the Hype,” which aggregates insight from more than 400 interviews with leading cyber security researchers who discussed non-malware attacks, artificial intelligence (AI) and machine learning (ML), among other topics. The report also includes a timeline of notable non-malware attacks and recommendations for incorporating AI and ML into cyber security programs. The vast majority (93%) of cyber security researchers said non-malware attacks pose more of a business risk than commodity malware attacks. Nearly two thirds (64%) of cyber security researchers said they’ve seen an increase in non-malware attacks since the beginning of 2016. There non-malware attacks are increasingly leveraging native system tools, such as WMI and PowerShell, to conduct nefarious actions, researchers reported. AI is considered by most cyber security researchers to be in its nascent stages and not yet able to replace human decision making in cyber security. 87% of the researchers said it will be longer than three years before they trust AI to lead cyber security decisions. Three quarters (74%) of researchers said AI-driven cyber security solutions are still flawed. 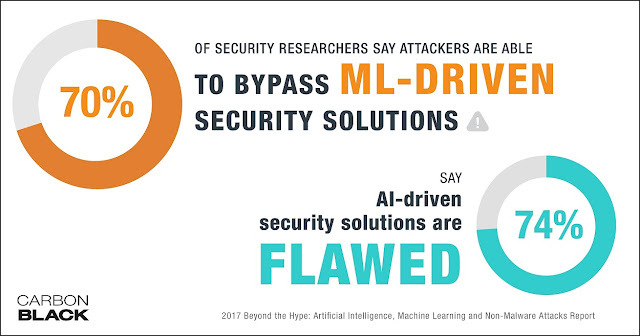 70% of cyber security researchers said ML-driven security solutions can be bypassed by attackers. Nearly one-third (30%) said attackers could “easily” bypass ML-driven security. Cyber security talent, resourcing and trust in executives continue to be top challenges plaguing many businesses.